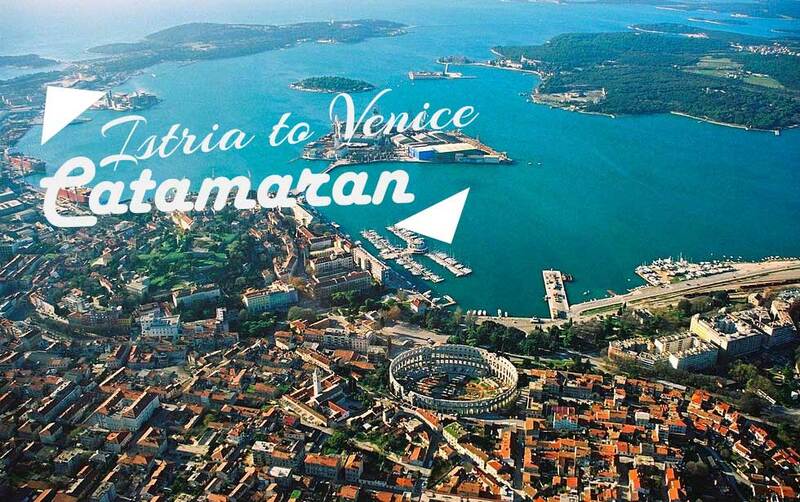 The Venezialines catamarans, San Frangisk and San Pawl, which operate the connection between Venice and Istria (Pula, Porec, Rovinj and Losinj) air air-cushioned catamarans with economy and VIP class saloons. The vessels have a bar with beverages and small snacks. Passengers with special needs should state their requirements at the time of booking. Passengers with reduced mobility should be accompanied. Wheelchairs and walking frames can be boarded, while mobility scooters can not be accepted due to space restrictions. Passengers may carry one checked-in luggage with no size or weight limit and one hand-luggage max. dimensions 56x45x25 cm and 10 kg weight. Handbags, briefcases, laptops, cameras etc. must be in your permitted piece of hand luggage. Exceeded luggage is charged additionally. Bicycles are allowed with supplement charge and should be booked in advance. Animals need to be announced at time of booking. Cats need to be transported in cages, while dogs up to 60 cm in length and 15 cm in height must be on a leash and have a muzzle. All animals must have a valid international passport and must be vaccinated. The time after the port name states the departure time, while the time in front of the port name states the arrival time. *** 06/09 Evening trip is delayed by 45 minutes due to Regatta Storica. May 2016 03.05., 06.05., 08.05., 10.05., 13.05., 15.05., 17.05. *, 20.05., 22.05., 24.05. *, 27.05., 29.05., 31.05. June 2016 03.06., 05.06., 07.06., 10.06., 12.06., 14.06., 17.06., 18.06., 19.06., 21.06., 24.06., 25.06., 26.06., 28.06. September 2016 02.09., 03.09., 04.09., 06.09. ***, 09.09., 10.09., 11.09., 13.09., 16.09., 18.09., 20.09., 23.09., 25.09., 27.09., 30.09. June 2016 09.06., 16.06., 23.06. July 2016 03.07., 07.07., 08.07., 10.07., 14.07., 15.07., 17.07., 21.07., 22.07., 24.07., 28.07., 29.07., 31.07. May 2016 01.05., 02.05., 09.05., 16.05., 23.05., 30.05. June 2016 06.06., 13.06., 20.06., 27.06. September 2016 05.09., 12.09., 19.09., 26.09. August 2016 02.08., 09.08., 16.08. You can use our ferry booking engine to make a reservation on Venezialines catamarans. Go to Ferry booking, or use a ferry booking engine on this page. The operator has the right to change departure times without prior notice. Be sure to double-check the information before travelling.